I am a big Buffalo Bills fan. Yes, believe it or not, there are still some of us out here. Though I may be ridiculed, though I may see little reward for my undying loyalty and eternal optimism, yet to do persist. Many have puzzled over the operational decisions of our team in the past decade or more. 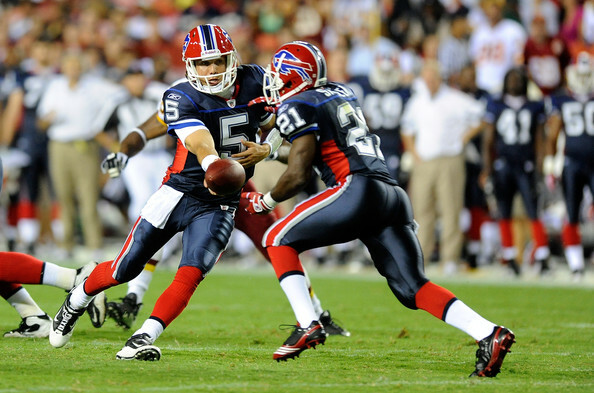 I think it started when then head coach Wade Phillips decided to start QB Rob Johnson instead of the city’s favorite quarterback, Doug Flutie, who had been a huge part of a mid-to-late-season surge to get the Bills to the playoffs. The fans were in an uproar, and the Bills did lose the game—although, of course, that’s debatable, since the win for Tennessee came by way of the infamous “Home Run Throwback” play in the “Music City Miracle” game… IT WAS A FORWARD PASS!!!! Ahem… Ironically, that was the last time the Bills made the playoffs. So what is this team’s plan? After a fairly encouraging pre-season, where Bills fans saw their team actually moving the ball and scoring points (as well as glimmers of brilliance from a few good players on defense and special teams) we have once again been jolted back to reality by an offensive offensive performance in game one against the Dolphins last week: this team is not that good. And it gets worse. Today the Bills will play in Green Bay (not an easy place to get a win!) and then the next four opponents are New England, New York Jets, Jacksonville, and Baltimore. Ouch. Young players like Buffalo’s new favorite running back, C. J. Spiller, our defensive backfield including Terrence McGee, Jairus Byrd, Leodis McKelvin and even Donte Whitner… not to mention a few players who have been around and whom we already know are capable of big plays: Roscoe Parrish, Lee Evans, and Fred Jackson. The biggest questions are still our offensive line (they are, in general, VERY young an inexperienced still), our defensive line, our wide receivers, our line backers, and our quarterback(s). Wow. Guess we’re still at the beginning of this rebuild, eh? If the offensive linemen actually do have the talent, then the Bills will be set for years to come. Three of the five starters have only 1 or 2 years of NFL experience. (And not full seasons, due to injuries.) I think they still need to bring in more talent, but if most or all of these guys develop, then they’ll be in good shape. The problem is, it’s still a very big unknown. Defensive line, line backers, and wide receivers are all positions where the Bills just need to bring in more talent. They still don’t have a reliable #2 receiver. I’m not even sure they have a reliable, game-breaking #1 receiver. Lee Evans is very talented, but I’m not sure he’s a #1 guy. The line backers have potential, but are also unproven. The Bills did bring in a few veterans at this position in the off-season (and recently added Akin Ayodele due to Kawika Mitchell’s injury) but again, this unit does not strike fear in their opponent’s hearts just yet. The defensive line has heart, but they may be lacking in talent, and surely the team is lacking depth there. Blame the QB (Trent Edwards) if you want, but QB is not the team’s biggest issue. Trent Edwards has talent, toughness, and football intelligence. He just lacks that intangible piece: the insatiable desire to win. More of the blame for poor QB play should be placed on the broad shoulders of his offensive line. They were awful in week one. If the Bills can get their running game established this year, they’ll do alright. They have some play makers on defense and special teams. And if they get the other team on their heels with the running game’s success, then they can also have success in the passing game. Unfortunately, this team has way too many “ifs”. Bills fans wonder “if” that will ever end. The Bills strategy seems to be very long-term. The best we can hope for this season, fellow Bills fan, is that our team is competitive (technically, even in a dismal performance by the offense last week, they were competitive right to the end of the game) and that we sneak out a couple of wins en route to a high draft pick for the 2011 NFL Draft next April.